Join us at 12:00 p.m. on the front steps of the library for a Read Out of Banned Books in celebration of Banned Books Week (September 23 – 29)! Faculty, staff, and students are participating as readers. If inclement weather, we’ll be in the library fireplace lounge. ¡Únete a nosotros a las 12:00 p.m. en los escalones de la biblioteca para leer libros prohibidos en celebración de la Semana de libros prohibidos (del 23 al 29 de septiembre)! La facultad, el personal y los estudiantes participan como lectores. Si las inclemencias del tiempo, estaremos en el salón de chimenea de la biblioteca. 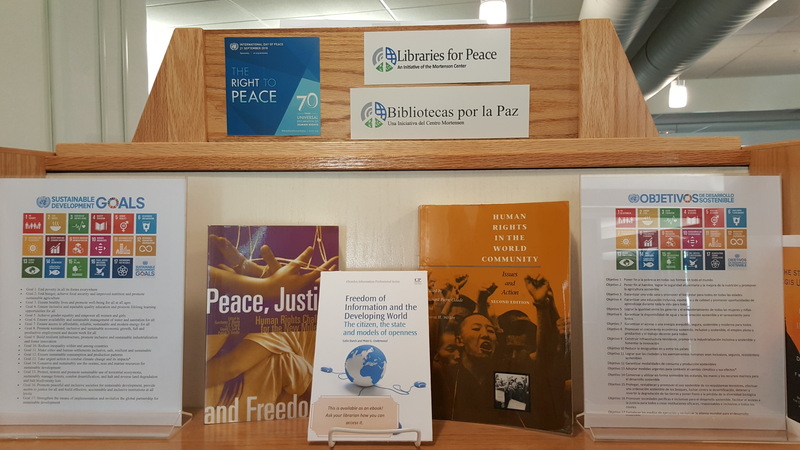 Stop by the library to check out our display in honor of International Day of Peace (September 21st). This year’s theme “The Right to Peace – The Universal Declaration of Human Rights at 70” was chosen to celebrate the 70th anniversary of the Declaration of Human Rights. Visit the following websites to learn more about the Right to Peace. The issue reported earlier this week has been resolved. If you encounter any difficulties with search results displaying in Prospector, please let us know! Come and see a facsimile of the famous book that started a revolution! The Archives is hosting an exhibit featuring a facsimile of the 1454 Gutenberg Bible, given anonymously in honor of Dennis Gallagher, referred to as “Citizen Gallagher’ by the donor. This is the first major book printed using Gutenberg’s invention of movable metal type. 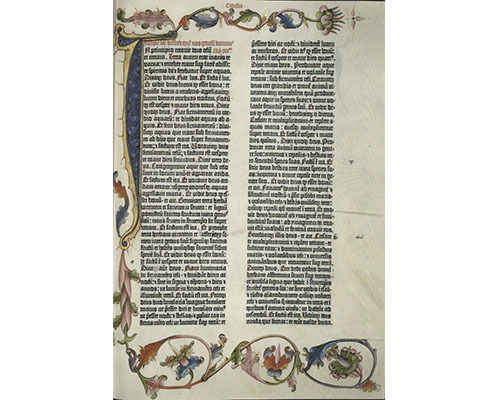 Displaying examples of earlier bookmaking, come and see how and why the Gutenberg Bible changed communication and consequently the world! Archive hours: Tues – Friday, 7:30am – 3:30pm. 4th Floor, Dayton Memorial Library. Posted in exhibits | Comments Off on Getting to Gutenberg…. In this new exhibit at the Dayton Memorial Library, Bryan Goldfeder is a Jewish glass artist based in Boulder. He shares the custom glass and photos of his recent wedding to open a window on Jewish wedding traditions. In the Doyle and Margaret Hartman Exhibit Gallery on the second floor of the library through the end of September. You are currently browsing the Regis University Library news blog archives for September, 2018.